The maxim that a fool and his money are soon parted is never more true than when the method used for doing the parting is a fraudulent financial scheme of the “pyramid” type in which people are promised massive returns on their investment but there is no proper foundation for such confidence. Such schemes are often dubbed “Ponzi schemes”, but why are they so called? The name derives from Charles Ponzi, although the man in question did not invent the scheme that bears his name. However, his activities became so notorious during the early years of the 20th century that the label “Ponzi scheme” has been attached to frauds of this type ever since. Charles Ponzi was born in 1882 in Lugo, a small town in northern Italy. His early years are shrouded in mystery, but it is known that he emigrated to the United States in 1903 with only $2.50 in his pocket. He settled in Boston. He drifted from one dead-end job to another, until in 1907 he became a junior clerk at the Zarossi Bank in Montreal, Canada. He did well at his job and became a manager, which was when he realised just how the bank was operating in terms of its investment business. The Zarossi Bank paid six per cent to investors on their cash deposits. However, these sums were not paid from the proceeds of careful fund management such as property investment but from the fresh deposits of new investors. Eventually the bank failed, with the owner fleeing the country with as much cash as he could carry, and leaving Charles Ponzi and the other employees out of a job. Ponzi forged a cheque to pay his way back to the United States, and this led to him being thrown in jail for three years. He did not get to the States until 1911, when he again fell foul of the law and served another prison term, this time for two years. It is often said that prisons are universities of crime, and this certainly proved to be true for Charles Ponzi. While in prison in Atlanta he came across two notorious criminals, namely Mafia boss Lupo Saietta and crooked financier Charles Wyman Morse. There is every possibility that he learned a great deal from those two masters of crime. After making his way back to Boston, he tried several new ventures which were, surprisingly for him, legitimate. One of these involved correspondence with potential customers in Europe and this led him to realise that a new line of business could open up for him. When a correspondent wanted to ensure a reply by Charles Ponzi he or she would send an international reply coupon (IRC) which could then be redeemed in the form of US postage stamps to cover the cost of the return letter or packet. However, during the period following World War One the relative values of these coupons as against American postage stamps was not the same – an IRC bought in Italy, for example, was worth more in American stamps than the actual cost of the postage. There was therefore an opportunity to buy IRCs in Italy and make a profit on them in the United States. Although the profit margin was small, if this operation could be ramped up significantly there was a potential fortune to be made. So this was what Charles Ponzi started to do. There was nothing illegal about this trade, but the difficulty was that it was impossible to carry it out in volume because each transaction had to be performed singly by taking an IRC to a post office and redeeming it for stamps. However, by recruiting agents Ponzi was able to start trading, and he also invited people to invest in the trade with the promise of a high return in a short time (50% in 45 days). Some people even went to the extent of taking out large loans and mortgaging their homes in order to make investments that were as large as possible. It was not long before Ponzi started to apply the principles he had seen at work during his previous employment at Zarossi’s Bank, such that his Securities Exchange Company, established in 1919, soon ceased to have much to do with IRCs. Instead, Charles Ponzi grew very rich by persuading people to invest and paying them with the deposits made by later investors. The initial success of their investments persuaded people to re-invest their profits, and it was due to people surrendering what they had already won that enabled Ponzi to take a controlling interest in Boston’s Hanover Trust Bank, buy a huge mansion, and live the life of a multi-millionaire. Needless to say, the bubble could not stay inflated for long! When questions were asked about how the business was financed, people started to call in their investments and an audit in August 1920 revealed a $7 million dollar black hole in the accounts. Ponzi had no choice but to plead guilty to fraud and was sentenced to five years in jail. After that, it was all downhill for Charles Ponzi. Further charges and convictions followed, and he was eventually deported back to Italy in 1934 – he had never bothered to take US citizenship. After a short time working as a financier for Benito Mussolini he fled Italy to end his days in South America, where he died penniless in 1949. 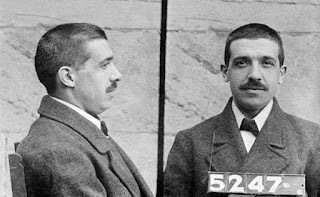 However, despite the sad example of Charles Ponzi’s career from rags to riches and back to rags, others since his time have sought to succeed where he failed, with the same inevitable result. The best that can be said for Charles Ponzi is that his name lives on.